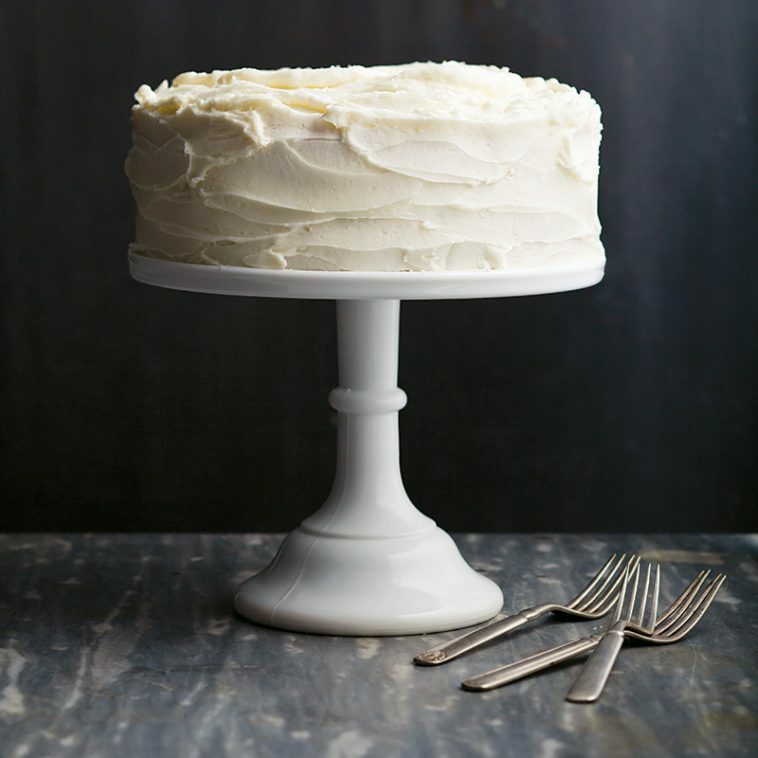 My all-time favorite cake is white cake with white icing. I will choose this every time if I am given a choice and I will bake this when it’s my turn to make dessert. I do love many other flavors and never turn down a piece of cake, but white is always the best to me. I think it goes back to my childhood. When I was a girl, my brother and sister and I would have one purchased cake per year from the local Pizitz Bake Shop and it was always for our birthdays. When October rolled around I was always excited and filled with anticipation for my white cake! The baker had a special filling between the layers…chopped pecans and finely chopped maraschino cherries. It was heavenly. When Neal and I married, Edgar’s Bakery reproduced the cake for our wedding! I was in heaven again. The simple white cake had the very same filling in the middle as I remember from my childhood. I still have the ballerina topper that was on one of my cakes. “Back then,” cake toppers were china. 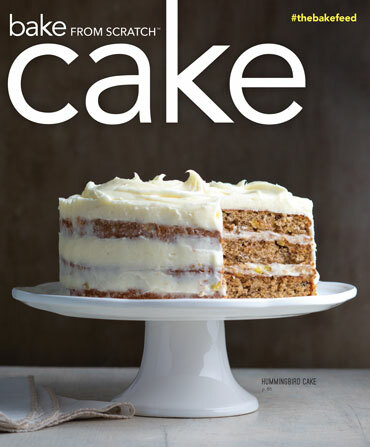 This recipe was developed in our kitchen for Bake From Scratch magazine. It’s a great dessert to serve with piping hot coffee. Preheat oven to 350°. Spray 2 (9-inch) round cake pans with baking spray with flour. Line bottom of pans with parchment paper, and spray pans again. In a large bowl, beat butter and granulated sugar with a mixer at medium speed until fluffy, 3 to 4 minutes. In a medium bowl, whisk together flour, baking powder, and salt. In a small bowl, combine milk, sour cream, and vanilla. Gradually add flour mixture to butter mixture alternately with milk mixture, beginning and ending with flour mixture, beating just until combined after each addition. In a large bowl, beat egg whites with a mixer at high speed just until stiff peaks form. Stir one-fourth of egg whites into batter. Gently fold in remaining egg whites. Divide batter between prepared pans (smoothing tops if necessary). Bake until a wooden pick inserted in center comes out clean, about 25 minutes. Let cool in pans for 10 minutes. Remove from pans, and let cool completely on wire racks. In the bowl of a stand mixer, beat butter at medium speed until creamy, 5 to 6 minutes. Gradually add confectioners sugar, cream, and salt, beating until smooth. That was my favorite cake from Pizitz, too. I had a local bakery reproduce that cake with the cherry filling for my wedding as well! Hope you had a wonderful birthday. The recipe sounds yummy. I think I will Use raspberry jam for my filling with a dab of frosting to hold it together. Happy Birthday Phyllis White on white cake such a classic Thank you for sharing. China cake toppers?? ?Ooo is there a collection there? I, too, would love the recipe for the filling if it is available. Thanks. Beautiful October! What a great month to have a birthday. Happy birthday Phyllis! Mom made cakes for my birthday when I was a small child, but by the time I was 12 , I asked to please make it a blackberry pie or cobbler. The blackberries were usually ripe for the picking when my July birthday rolled around and I didn’t even mind going out to the patch and pick them myself! Mom has been gone since 1979, but most years one of my younger sisters will make my old favorite. As others have requested, may we have the filling recipe for the filling, or does one simply add the pecans and cherries to some of the buttercream filling? Thank you so much. I have to admit that there isn’t a cake I don’t like. Now that my children are grown and have their own homes, I don’t bake cakes unless there is a special occasion. Otherwise, I continue to sample, and lick, and taste, and gobble until the cake is gone. Can you tell that I don’t have much will power? Anyway I am hosting a birthday party for a wonderful friend in a couple weeks and I will try this recipe then. Thanks so much. Happy Birthday Phyllis…the cake looks yummy! Thank you for the recipe. Everyone in our family had a favourite cake that my mom would bake for birthdays. Mine was a walnut tort with coffee butter cream icing. Now that my mother is unable to bake because of her declining health, my sweet Godmother has taken over. And at 56, I still get my favourite cake every February! Your cake is lovely and sounds delicious! When the weather was right, Mother always made divinity frosting. Heavenly! I prefer pound cakes to layered; but, Mother’s minced meat bundt cake is still my favorite. I had one Pizitz bakery cake in my life – I was 6. I still remember the smell of that bakery and the taste of that cake! Thank you for the recipe! I will definitely use it! The Black Midnight Cake with white vanilla buttercream frosting from my 1961 Betty Crocker Cookbook. It tastes like heaven. One year my brother made it for me and tinted the icing a beautiful pale pink. I think that made it taste even better! This cake looks beautiful, and I can only imagine how good it is. The perfect cake for just about everything. Hoping to make one soon, and that mine will look as beautiful as this. Thank you for sharing the recipe, and also for creating that wonderful Bake from Scratch publication. Please share recipe for filling. Thanks! Please share the recipe for the cherry pecan filling. I too have an October birthday and looked forward to my bakery cake each year. I was extremely fortunate as my grandfather was a professional baker and always brought me huge beautifully decorated cakes, also white with buttercream frosting– the best!! Papaw, as I called him, would work in the bakery all week and then bake for us on weekends “to relax”. He made absolutely everything at home–bread, Danish pastry, dinner rolls, chocolate chip cookies–and it would all melt in your mouth! When he passed away six weeks short of his 98th birthday, I tucked a big bag of chocolate chips at his side and asked him to have a batch ready for me when he knew I was joining him. Love white on white. Thank you. But nothing said about the filling? Any chance you have a recipe for the maraschino/pecan filling?? I would love to see that too! Please give the filling recipe! My kid will love this. A white cake lover all the way. And I’ve never done buttercream with cream before. I must try that. I tend to go the cooked frosting route because I find buttercream just too sweet. Maybe the whipping cream tempers that?